Ok, I know it is the VERY last day of September, and I told you I'd tell the story of our road trip to a real castle by the end of the month... so here goes! Sir Harry Andrews lived from 1890-1981. Sir Harry was an Army nurse during WWI. After his time serving in the field hospital during the war, Harry Andrews returned to the Cincinnati, Ohio area. A couple of years ago I was in the Cincinnati area with my friend Bethany (who grew up there,) and I commented that one of the buildings we passed sort of looked like a castle. She laughed and told me it was a water treatment plant. Then she asked me if I had ever been to the "real castle" in Cincinnati. I had not, but when we were planning a weekend trip to Cincinnati this past Spring, I remembered what she had said and asked her for more information. We are so glad I did! Thanks for the suggestion, it was awesome! 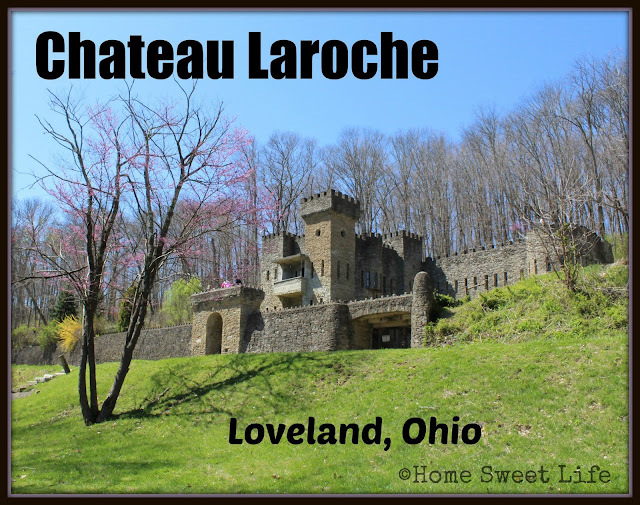 Chateau Laroche, also known as the Loveland Castle, was built by Sir Harry Andrews from about 1930 until his death in 1981. Harry spent his time after WWI investing in the lives of the boys of his Sunday School class, which also became his Boy Scout troop. The troop frequently camped on the bank of the Little Miami River where the parents of a couple of the boys had some land. Wanting something weather worthy to keep their gear, Harry built two stone tents. Then the parents donated the land they had been camping on and Sir Harry and the boys began spending more time there. 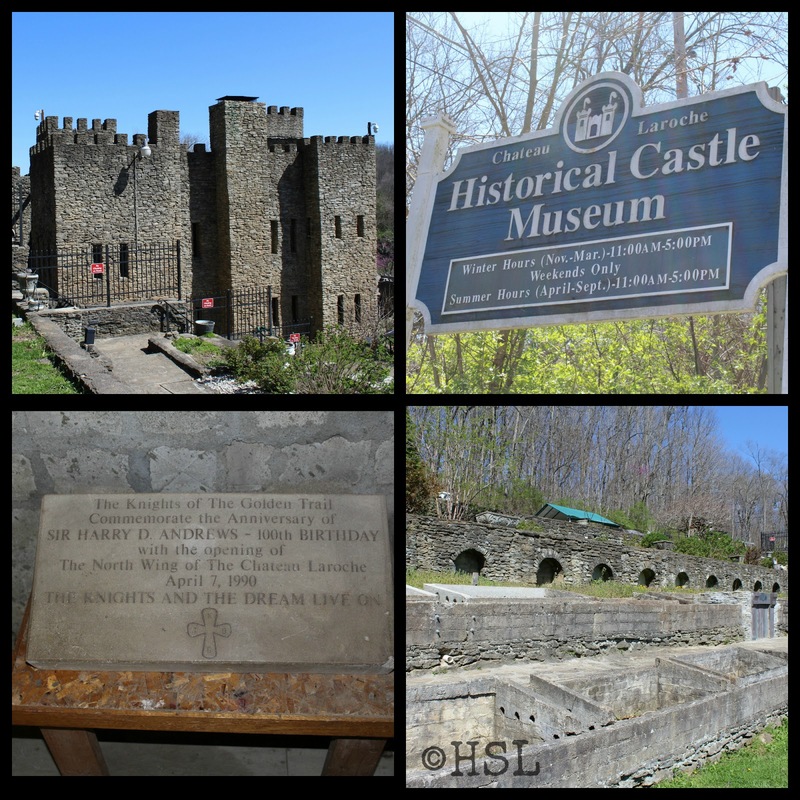 Harry had formed the Scout Troop as the "Knights of the Golden Trail" (KOGT) in 1927, and by 1930 had decided his knights needed a castle. One stone at a time Harry built the initial part of the castle, and often put the boys to work helping as they watched because they wanted to spend more time with him. 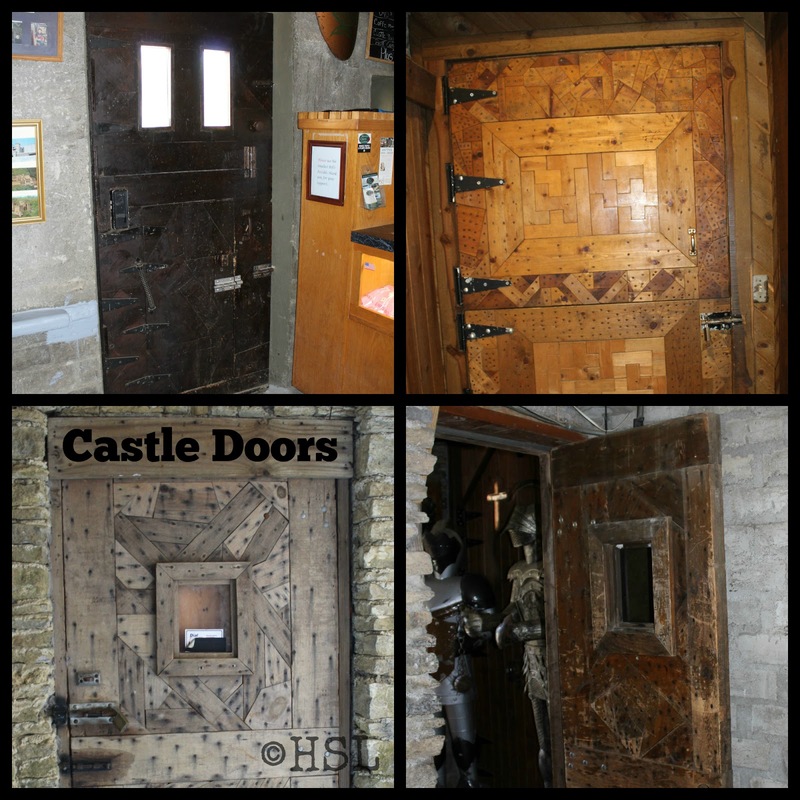 Working as a team, over several years, the castle grew to become a place where Harry lived, and the boys frequently visited. Harry Andrews never married (his fiancé had married someone else while Harry was overseas in the war,) and so he invested heavily in the lives of his "knights." You can learn a lot of the history of Loveland castle on their website: www.lovelandcastle.com but you really need to visit!!! During his lifetime, Sir Harry Andrews funded the college education of over 40 of the Knights from KOGT. 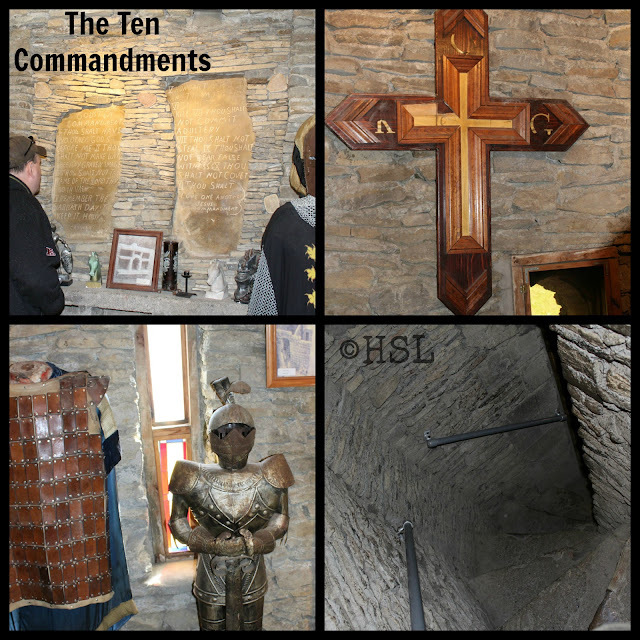 Their only rules were the Ten Commandments, which are displayed on a wall in the castle's chapel. Harry had been a nurse during WWI because he objected to the killing from a far of the guns of then-modern warfare. Serving as a nurse allowed him to help his countrymen, without being called upon to kill anyone. The KOGT was designed to inspire the boys to live lives of honor, valor, and purity hearkening back to the traits of knighthood as Europe emerged from the Middle Ages. Harry wanted better for these boys than what he had to endure during the war. Loveland Castle has elements of French, German, and English castle architecture. Words really cannot describe it well enough, you simply need to go see it! I've tried to give you a preview through the pictures below. 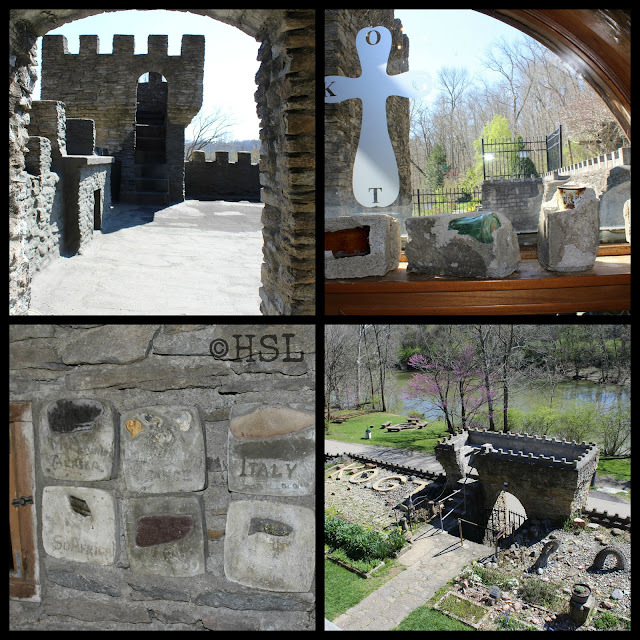 Castle doors, archer shaped windows, a dry moat, a secret stairway, and of course a few suits of armor can all be found in Sir Harry's castle. When Sir Harry died he willed the castle and the grounds to the KOGT who were no longer boys, but an assortment of men, who continued the building by finishing the ceiling in the final wing after his death. Because Harry had been knighted, he was able to knight others who lived by the high ideals of the Ten Commandments and focused on a life of serving others. These men (and one woman) still run the castle today. There is always a knight on duty when the castle is open, plus you will find other volunteers there as well. We were fortunate on the day we visited that one of the knights whom Harry had sent to school was on hand and gave us a guided tour with extra history about their group and Sir Harry's life. There are so many cool things about the Chateau Laroche that made it a little self-sustaining estate up the hill from the banks of the river. When you visit, be sure to look for the following: Bricks made with recycled trash as filler to make the interior walls, a beehive shaped bedroom to hold the heat, hotbed frames to grow vegetables, and a hidden peephole to view the front entry door from above. Also look for The Dungeon, Sir Harry's office, the ballroom, and the kitchen! Sir Harry Andrews was an intelligent man, holding more than a dozen college degrees when he died. We were told one of his favorite things to do was to solve puzzles, like the Pentominoes and Tangrams you will find in the game room. The Castle is open on weekends only from October-March, and seven days a week from April-September. Admission is $5 person, and $3 for children 12 and under. 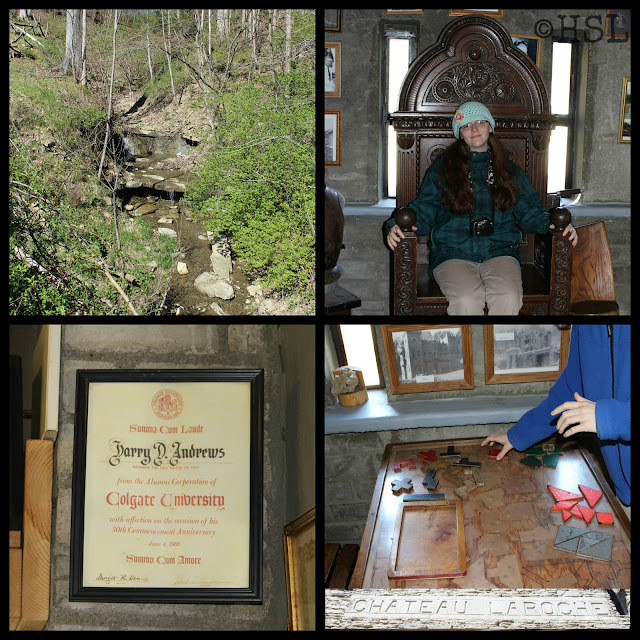 This gem of a find is SO worth the drive down the road that Sir Harry built. Be warned: the road is fraught with tight switchbacks as you descend, so NO BUSES, and you'll prefer having your best driver at the wheel. There is parking for 30-40 cars at the castle, but we were told that the 3rd Saturday of each summer month Chateau Laroche hosts Castle Days where medieval food and reenactments like jousting occur. Because of the popularity of Castle Days, you'll need to park at the nearby Meijer and ride the shuttle. Chateau Laroche, a.k.a. 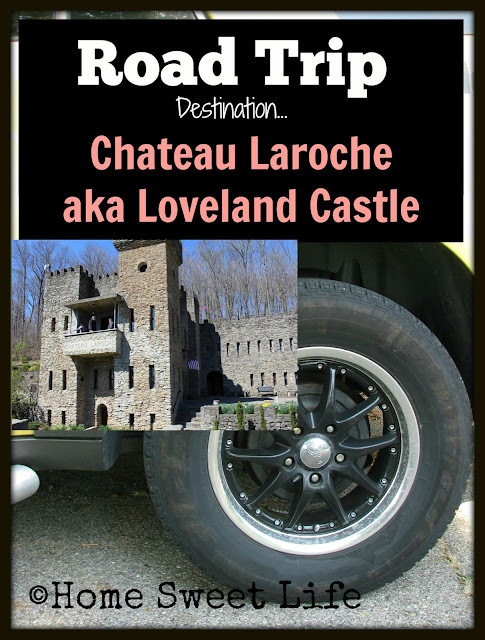 Loveland Castle is located at: 12025 Shore Drive, Loveland, Ohio. 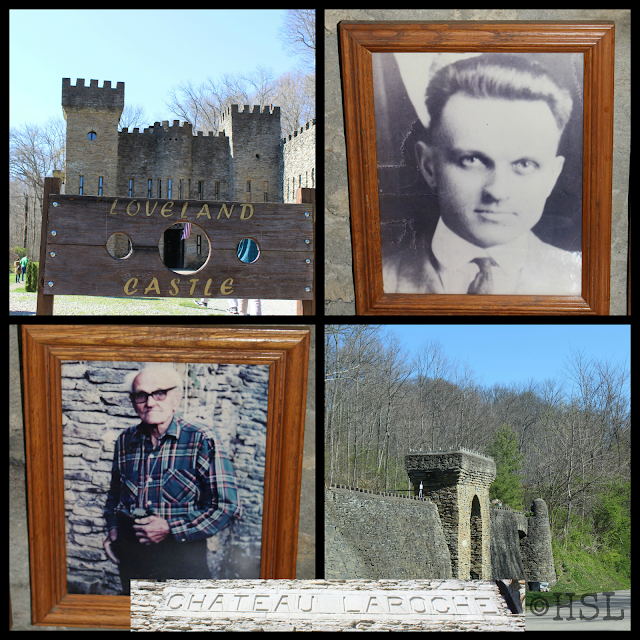 To me, Chateau Laroche shows an excellent example of how one life, well-lived for God, can influence a whole generation of people to follow Him as well. 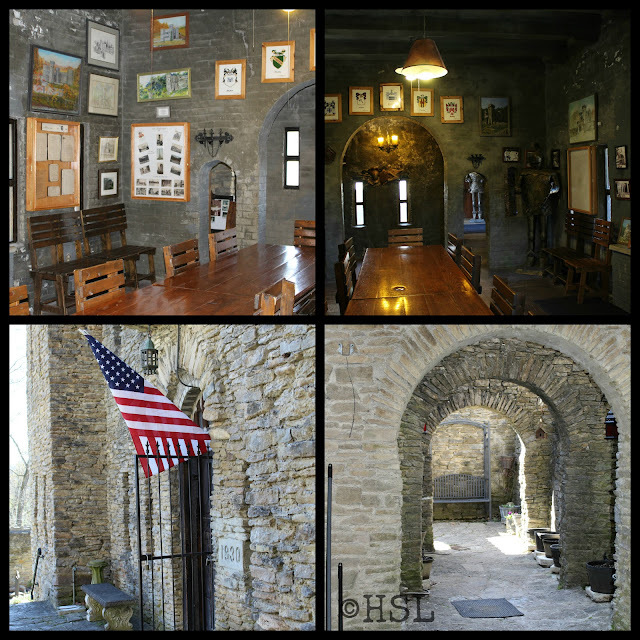 I hope you've enjoyed our trip to an actual castle... located in the Midwest! Who knew?! Now you do! Come back soon for another great Road Trip idea. We have lots more to share this Fall. When I think about collecting, I wonder what it would be like if I collected something. It seems like most of my life I've spent collecting photographs, or mental images of places I've been or things I've heard. What If I collected something else? 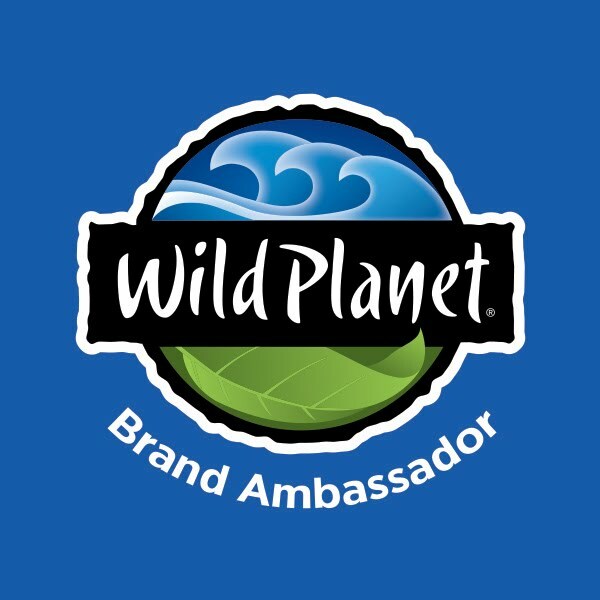 Like trinkets, bracelet charms, or commemorative spoons? I know you're probably laughing now, but those are all things I've seen collected! Today I should have been collecting funny things my children said. There were quite a few of them! We all had a good laugh as we went inside, careful not to step on the red and green gooeyness. "Either that is thunder, or the Budweiser trucks are all going home right now." ... also said by the 18 year old. We live a couple miles down the road from the distribution plant, and the early morning traffic contains a lot of rumbling delivery trucks. These words are from the girl who when she was four always asked me to "Turn the candles on Mama?!" Who knew that when she was five my MIL would buy us 'candles' with an on-off switch? What do you collect? I think I'll stick with memories! 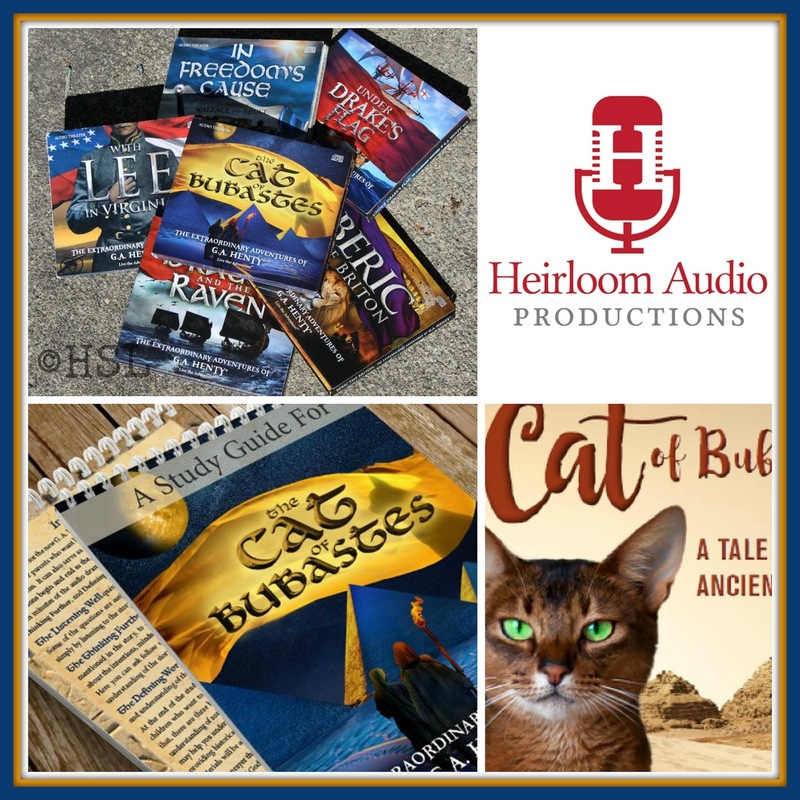 Take a journey back to Ancient Egypt with the latest audio theater offering from Heirloom Audio Adventures: The Cat of Bubastes. Arlene has been anxiously awaiting this sixth title in the Extraordinary Adventure of G.A. Henty series and so have I! 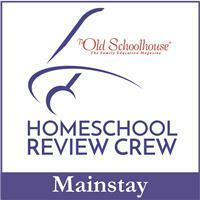 We were delighted to receive it to review as a part of The Old Schoolhouse Homeschool Review Crew. Besides the 2 CD set, we also received several downloadable bonuses including a 47 page PDF Study Guide, a poster sized printable copy of 1 Chronicles 17:20, the soundtrack MP3, and the e-book version of the original story with new illustrations. A snippet of simple honesty here: Arlene had the whole 2 hour audio theater listened to before I got home from work on the day it arrived in the mail. Normally our first time listening to an Heirloom Audio Productions story is together, but she had been so eager for this one to arrive that I gave her the go-ahead to listen the first time without me (after her other schoolwork was done for the day!) Since Arlene is 16, I was not concerned about anything that might be present in the story that could shock or surprise a younger listener. 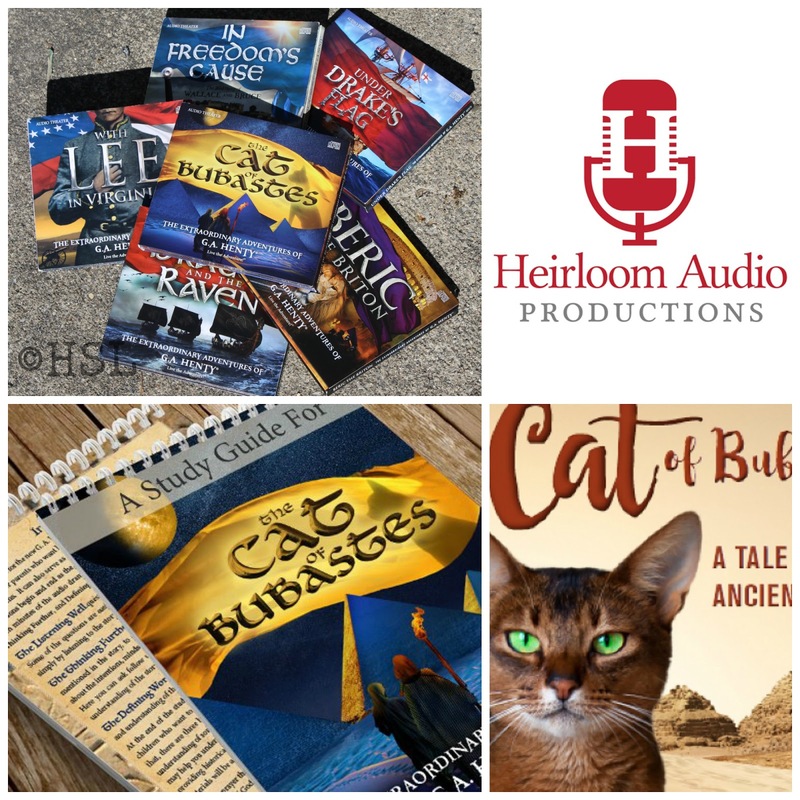 Since these stories from Heirloom Audio Adventures are designed for ages 6-16, but enjoyable for the whole family, I felt confident that she would learn something while being entertained. The Cat of Bubastes is set in Ancient Egypt. How ancient? Back when Moses was still a prince of Egypt. The story begins as Amuba and his protector Jethro are being escorted from their country to Egypt as captured slaves. We soon find out that Amuba was a prince, and his father the King was killed in the battle with the Egyptians. Because their country was so far to the north (near the Caspian Sea) they travel for months on foot to reach Egypt where they are assigned as slaves to Ameres the High Priest in the city of Thebes. Ameres shows compassion and has Amuba live as a companion to his son Chebron (both boys are 16,) and assigns Jethro to duty as protector of his daughter Mysa. It took me a while to get used to the Egyptian names used in the story, but the listening was easy as the actors chosen for each part have unique voices that made them easy to differentiate. Since my first time listening was with Arlene and her sister in the car, I wasn't able to look at the names in print until we got home. Once I saw the names in print, it was much easier to keep the names associated with the correct characters in the story. The study guide can help you keep them straight if you also struggle with the unusual names. I also appreciated the frequent extra "Expand Your Learning" sections in the Study Guide about topics such as the Egyptian diet, crocodiles, hieroglyphs, and mummification. The story of The Cat of Bubastes covers a lot of the parts of life in Ancient Egypt that you may not have previously been aware of: worship of gods, worship of cats, and practices like mummification. When you're going through the Study Guide, each section of plot twist in the story has a part with three sections: Listening Well, Thinking Further, and Defining Words. 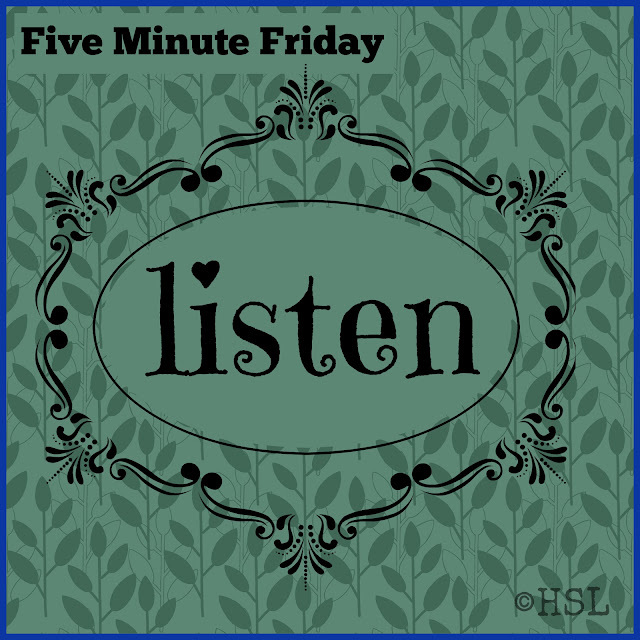 These three sections help you make sure that everyone listening to the story is understanding what is happening. If your children have recently studied Ancient Egypt they may not need to look us as many of the defining words, but it is still good to ask and make sure they are comprehending the storyline. As the friendship between Amuba and Chebron grows, they encounter allies through the characters of Rabah (John Rhys-Davies) and Chigron (Sylvester McCoy.) Amuba even has an encounter with Moses (voiced by Russell Boulter,) and the whole family is both amused and then concerned by a visit from Permotep (Anthony Daniels.) I can say we honestly laughed out loud at Permotep! Of course, Brian Blessed returns to voice the amiable G. A. Henty. Once again Heirloom Audio Adventures had created a masterpiece by adapting a favorite G. A. Henty novel into an audio adventure for the whole family to enjoy! This sixth adventure in the series does not disappoint! Full of intrigue, a devious plot to overthrow the High Priest, and rescue missions, the story is woven though out with Biblical themes that help the listener discern the right choices from the wrong ones. After all of the other sections of the Study Guide, you will find three Bible Studies to help your family with a deeper understanding of these themes: God Meant it for Good, The Knowledge of God, and Idolatry and Tyranny. The back of the Study Guide also includes a page of suggested further reading for older students and adults, as well as two pages of historical background for the story of The Cat of Bubastes. We give The Cat of Bubastes four hearty thumbs up! We took it along with us on our vacation and all four of us enjoyed it. Kurt was trying to figure out the plot twists, and occasionally stopped the CD to ask us if he had guessed correctly. 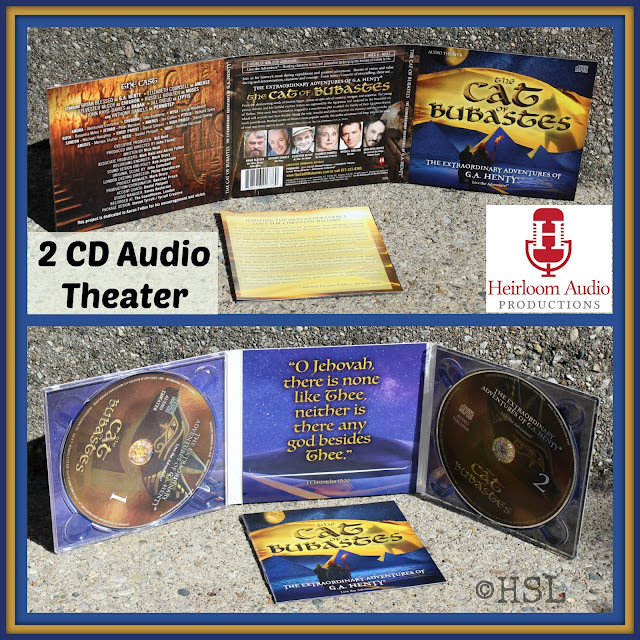 You can order your own copy of this wonderful audio adventure for only $29.97 plus shipping, or order the four pack set at a discount and give them as gifts! 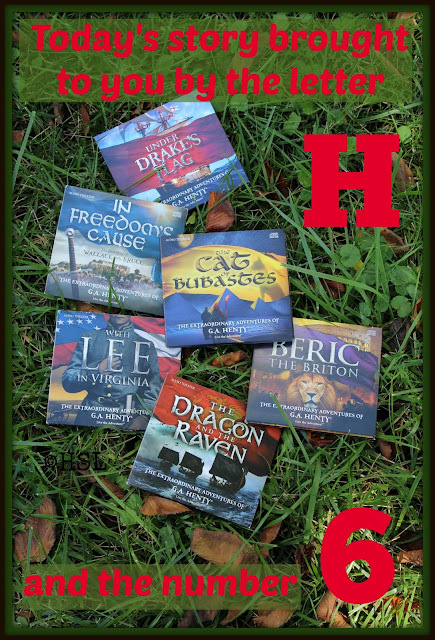 If you'd like to read more about the previous titles from Heirloom Audio Productions, you can read our past reviews: Under Drake's Flag, In Freedom's Cause, With Lee in Virginia, The Dragon and the Raven, and Beric the Britain. 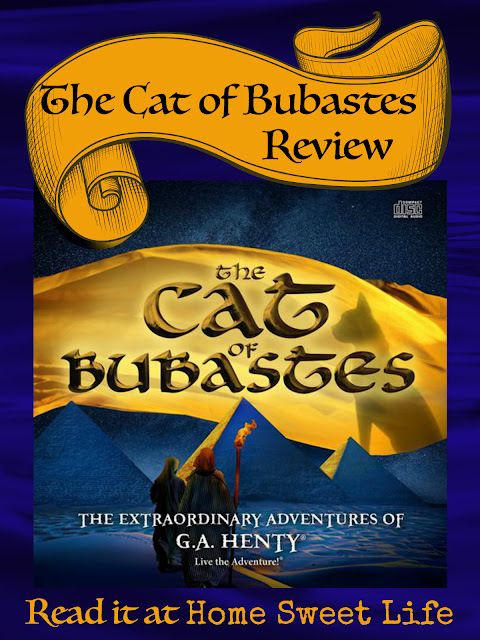 To read what other Crew families thought about The Cat of Bubastes, click the banner below. Powerful. Humbling. Challenging. 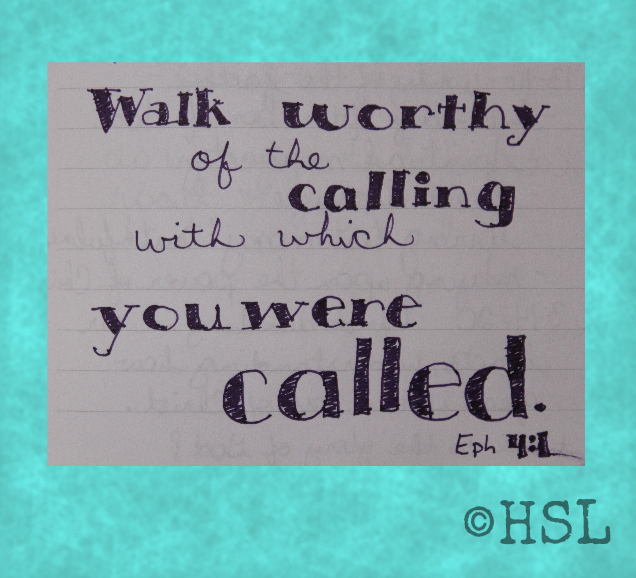 Encouraging, Christ-focused and God-honoring. These are my first thoughts upon completion of the new book The Pray-ers / Book One Troubles by author Mark S. Mirza. Other thoughts about this book from CTM Publishing Atlanta include: impactful, comforting others with the comfort we have received, and for our good and God's glory. 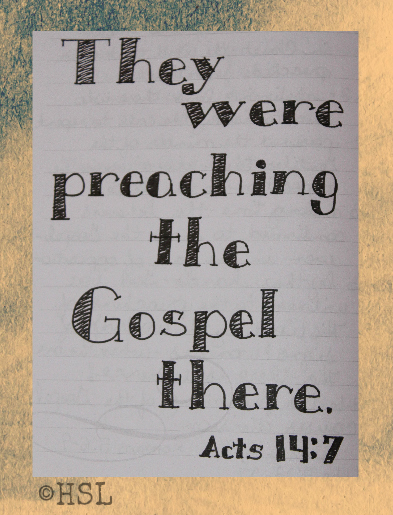 How many times has God used a book to radically change your life? Other than my Bible, only a few. This book will be added to that short list. God knew I needed it, and He had been preparing me for its arrival. Before and during this review our church has been studying Christ's teachings on the Christian life, and specifically prayer, from Matthew 5 & 6. The week before it arrived I had simply asked God to show me where I needed an overhaul. The Pray-ers is not a devotional, but rather a historical fiction book about prayer in the lives of the character's. 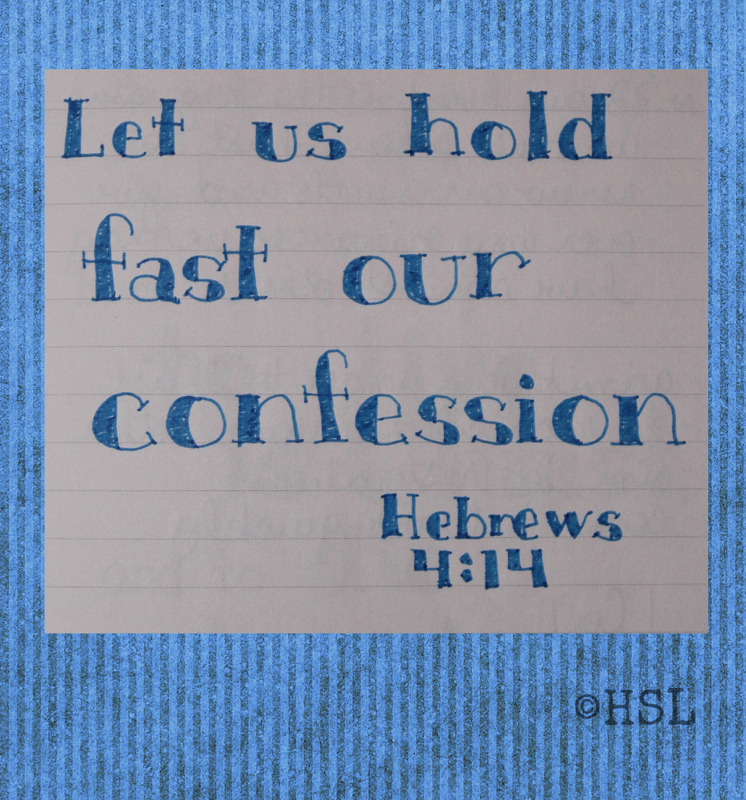 It focuses on God-honoring, Scripture-centered prayer and how it can be done in our own lives. This book challenges the reader to be transformed by the Holy Spirit from someone who prays their own prayers into someone who prays Scripture while truly seeking the heart of God. The Pray-ers / Book One Troubles is the first in a planned trilogy that introduces us to the main characters in three time periods. Before you begin reading it is critically important to read through the Preface where the author, Mark S. Mirza, outlines not only why he felt compelled to write the book, but also his deviation from common English Grammar rules on names, as well as pointing out where the focus of the book should lead his readers. Trust me, you need to read the Preface! I found his notes here immensely helpful. The text of the book includes footnotes whenever a Scripture is referenced. In his Preface, Mr. Mirza stated he hoped these would be helpful for subsequent re-readings of the book. I found them helpful on my first reading, as I often found myself pausing in the story to look up which text was referenced, either in my Bible, or on the Bible App on my phone. In The Pray-ers, the portrayal of the Spiritual world and the continual battle between the demons and angels over the minds of humans reminded me of how Chuck Black described this battle in his War of the Realms series. For fans of Chuck Black's writing, The Pray-ers / Book One Troubles should be at the top of your "to-read" list. It is rare to find an author who can work the complexities of Spiritual Warfare into a book without losing the flow of the storyline, but Mark S. Mirza has done a seamless job of it. The three eras covered in the book are the First Century (early church,) the Nineteenth Century (after the Civil War,) and the Current Era (about 2013.) Although most of the characters are fictional, they do come to life on the pages of The Pray-ers. I found myself saying "Amen!" 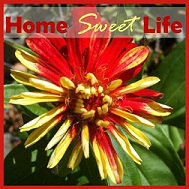 alongside them to many of the joys and struggles of everyday life. Thales is the focus of the First Century plot line, and we see watch him go from young and overly ambitious to slightly older and more God-focused. The Nineteenth Century plot line focuses on just a few days in the life of an itinerant preacher in central Georgia, Alexander Rich. Brother Alexander lives a life focused on God, shepherding his various small flocks, and spending much time in prayer for them. The Current Era focuses on the lives of Dr. Dale Riley, a college professor and track coach, and his wife Margie. In each time period, the main chapters find them selves with "Troubles," as a result of something God is using in their lives, or the lives of their friends or colleagues, to bring people to Himself. I could tell you more of the storyline, but I won't because you need to be impacted by reading it yourself! Whether you are a young Christian, a more mature believer, or someone who is searching for God, this book should make a difference in your life! I have already told both of our daughters that it will be required reading for them for this Fall. I would recommend it for ages 16 and up. I often stopped to ruminate on how a character handled a situation and asked God for His wisdom in specific areas in my life that He brought to mind. The Pray-ers / Book One Troubles is available in both softcover ($23.95) and e-book ($4.99) versions. Book two in the trilogy is expected to be out by Christmas of this year. I am definitely putting it on my wish list! To find out what other member of the Homeschool Review Crew thought about The Prayers, click on the banner below. 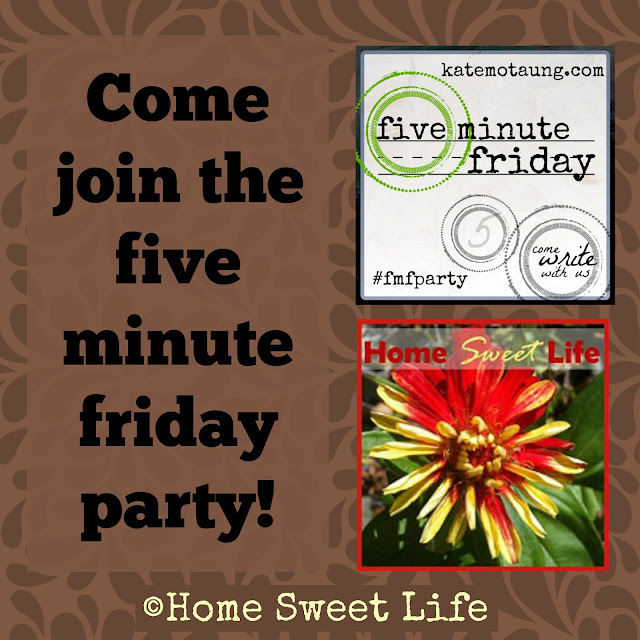 It is Five Minute Friday again. When I think of the word listen I think of the Proverbs. They continually point us towards listening to God's voice of wisdom and understanding, and away from our own vain ideas. I wish I was a better listener. God is working on me in that though. Recently He has been telling me to listen for His voice when I pray. 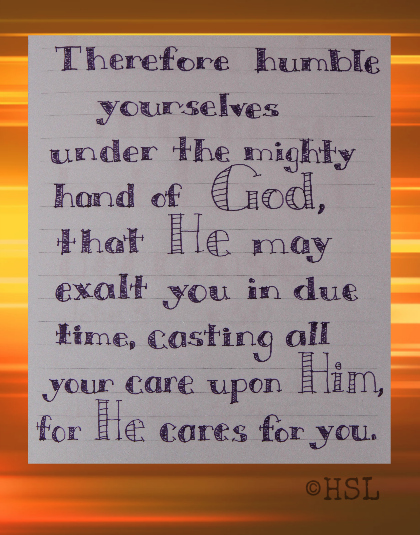 To come before Him in humility and awe. 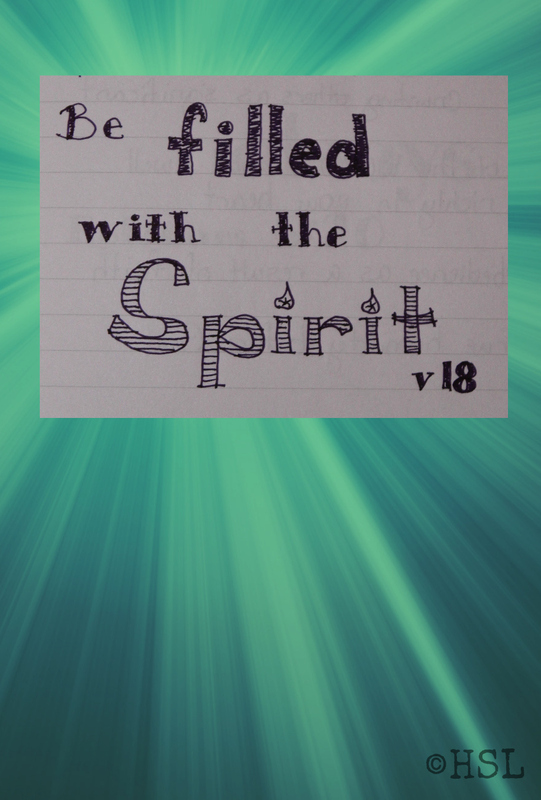 I cannot say that I've really Him speaking, but I know that my spirit has had much more peace. How do you turn off your overactive brain and just listen? 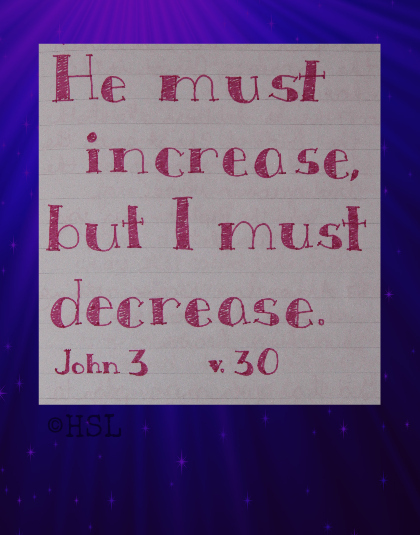 I'll keep coming back to trusting Christ to give me the strength to hold my thoughts captive to His. I've been reading a book that is about prayer, and it has frequently mentioned keeping a notebook so you can write down whatever thoughts interrupt your prayer time so you can let them go and attend to them later. I've used this idea before in writing down the thoughts that crowd in before sleep, so I'm going to try it for my specific prayer time as well. I'm hoping God will be recreating me into a better listener. We have two ears, are we using them to listen? Thanks to a not so gentle nudge... shall we say push... from my dear friend Annette, I'm going to try this five minute friday writing prompt. 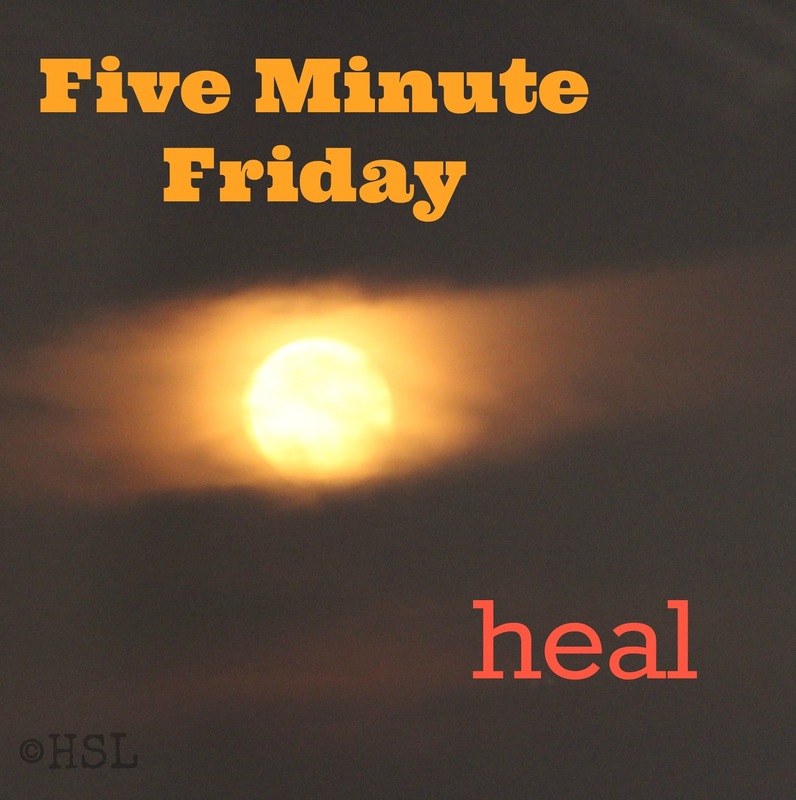 I'll link up the result, er rambling, over at katemontaung.com and then read what others have to say about this week's word: Heal. When I think of the word heal I think of God the Father and Jesus Christ as the Sustainer and Creator of life. I think about how the Israelites had a specific name for each attribute of God, and how one of the El's was the one that called God the Great Physician and Healer. I think of the healing I have seen in our own home this past week as Emily had her wisdom teeth out on August 31st, and has been pretty much fully recovered for several days. How is that possible? 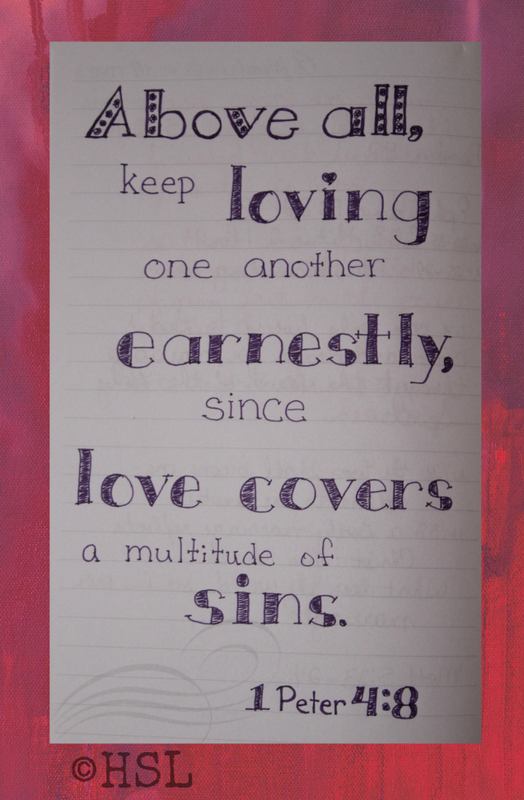 Only through God reaching down and healing her. Emily's wisdom teethe were super tight, and pushing against her other molars AND against her jawbone. I saw her X-rays. While her surgeon stated that it should be a pretty straight-forward operation, and Em should recover well, I really, truly though it would take her much longer. God was so very good to her! Her friends helped the healing by stopping by to encourage her, and bringing a couple small gifts to lift her spirit. Healing has been happening a lot recently in my heart. I've struggled with some anger towards God, and others, over the past few years, and God has mercifully taken it away. I am a new creation. 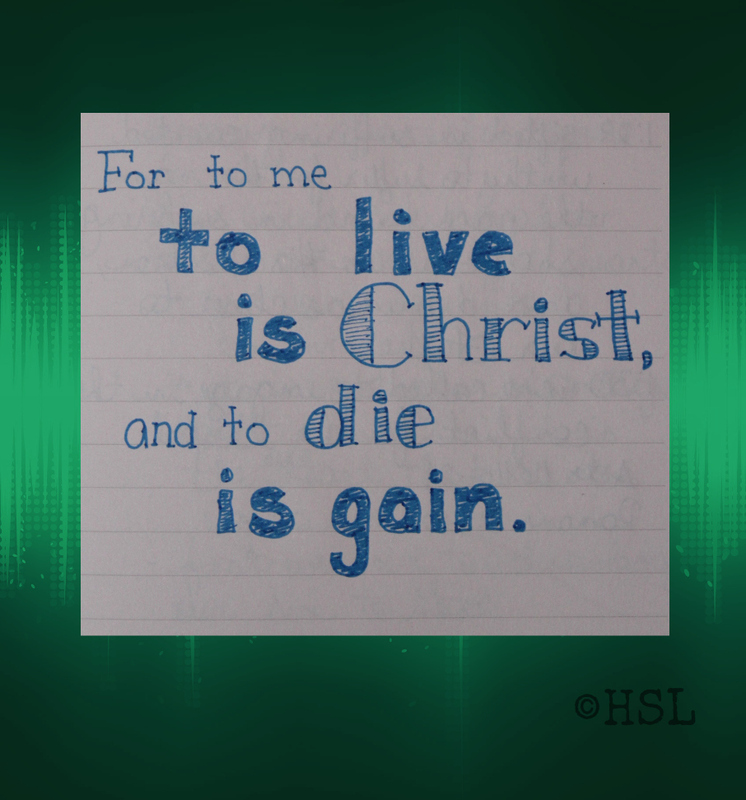 Christ lives in me, and it is no longer the yucky old sinful Carol who lives in my heart, but a joy-filled handmaiden of God. Five minutes goes by fast. I went to work and the girls spent the day cleaning the house. That evening after Kurt got home, we enjoyed dinner at our friends' house. The food was delicious, and the fellowship was encouraging. Time always seems to pass so quickly when you're enjoying good company, but by 8:30 p.m. I knew we had to head home, I was exhausted. I took Kurt to work, got an oil change, and then headed to work. The girls finished up the house, and got ready for Wednesday. This was the deeper cleaning of the house, like scrubbing the bathrooms and sweeping everything. Monday was more pick up, put away, and do laundry since we had been out of town the previous week. Tuesday afternoon I came home, got the girls, and the sandwiches they had made, and we went to pick Kurt up at work. Normally he drives himself, but we were headed to an Indianapolis Indians game Tuesday night and didn't want to have to stop and pick up his car on the way home. 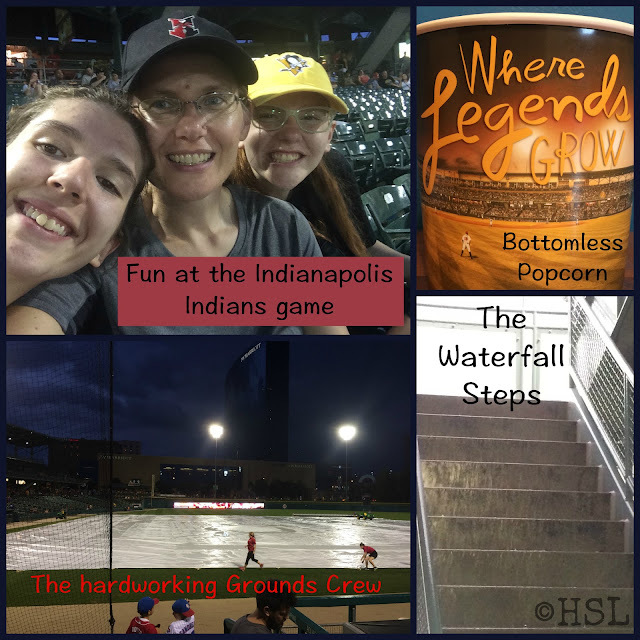 The weather was beautiful for the first two and a half innings, and then a thunderstorm rolled through downtown Indianapolis. The ground crew ran onto the field as the players headed for the dugout and all of us spectators headed for the concourse to stay out of the downpour. It rained so hard that the steps to the upper deck of seating became a lovely waterfall as the rain came gushing down to the concourse and then on down past our seats to the drains. I would not have wanted to be on the grounds crew at Victory Field. They did an excellent job, but I know it was a tough night for them. The winds were gusting as they rolled out the field tarp, then they were blowing like crazy as they unfolded it and dragged it across the infield. The field was covered, but the crew was soaked! After the storm passed and the rain stopped, the ushers came back out and dried off people's seats for them ( for those that stayed) and about an hour after the play was halted, the game resumed. For snacks we decided to get the bottomless bucket of popcorn. The concessions at Victory Field are fairly decently priced compared to other minor and major league venues. We had the bucket refilled twice, so we definitely got our money's worth. Because of the hour long rain delay, we decided to head home at the end of the fifth inning. The Indians lead the entire game, and ended up winning 7-5 over the Toledo Mud Hens. In case you didn't know, the Indianapolis Indians are the farm team (minor League affiliate) for the Pittsburgh Pirates. We've watched players over the years who began at Victory Field who ended up having careers with the Pirates, most notable is probably Andrew McCutchen. Kurt went to work, and Arlene and I took Emily to the Oral Surgeon. Emily had her wisdom teeth removed. She made me promise beforehand not to record her on anesthetic, which I would not have anyway, because that's just mean. Emily did really well, and her Surgeon and her team were all super sweet and helpful. Afterwards we had to stop at the pharmacy to pick up an antibiotic for Emily so Arlene go the job of "watching" her sister. If you've ever been around someone who is coming out of sedation from dental work you'll know what this entails ... making sure she stayed seated on the bench, and that she didn't drool down her chin while her mouth was full of gauze. Then we went home and spent most of the rest of the day watching movies while Emily spent a lot of time with her ice packs on her cheeks. In the afternoon Em decided she wanted a nap, and I guess Arlene decided to take a sympathy nap too, because I came in the TV room to find them: one sprawled out on each couch and very soundly asleep! I needed to go back to work, so Arlene and I had a powwow and I wrote down specific detailed instructions about her nursing duties to take care of Emily for the day. Arlene texted me updates during the day, and I called home on my breaks. One of Emily's friends came to visit her in the afternoon and brought a care package full of post-surgery approved foods: yogurt, mashed potatoes, and frozen fruit bars. Emily once again spent a lot of time icing her jaws, and in general took it easy. I believe there was a lot of TV watching again, but that's OK once in a while! After all, the girls are 18 & 16, they have a good dose of discernment, and we had talked about what would be ok, and what would not be ok while I was gone. The day dawned bright and sunny, and Arlene and I had errands to run, so we convinced Emily to take some tylenol and come along with us. I think was the stop at the library that won her over to our plan instead of staying home! Also notable along the way was a stop at the local Historical Society for Arlene to enter the checkerboard quilt she made for 4-H this year in their winter quilt show that opens in November. It is the first quilt Arlene has made, and she did a wonderful job. She earned Champion at the County 4-H Fair, and received a blue with special merit at the State Fair. I think entering it in this quilt show will encourage her to start work on another one for next year this winter. Friday afternoon one of the girls' friends from working at the State Fair stopped by to visit, and return Arlene's pillows that we all missed while packing up their things. (More on the State Fair adventure later.) Then Kurt got home from work and I made a dinner that was yummy and easy for Emily to eat in small bites. We all stayed home all day long. It might have been somewhat hard on Kurt to understand my desire to stay home, but I really just didn't want to go anywhere! The house needed put away and organized. While the girls are very good at the surface part of putting stuff away, they sometimes lack the motivation to purge and put everything back where it actually belongs long-term. Plus, I REALLY needed to clean off my desk. It had been waiting for months for me to go through every single thing in the mail basket and reclaim my workspace. Please tell me I'm not the only working Mama who struggles to reclaim their desk from all the "important" things your family puts there so they won't get lost?! Arlene continued to stalk the mailman, to no avail. She will have to wait until mail resumes on Tuesday. She is waiting for our copy of Heirloom Audio's The Cat of Bubastes to be delivered so we can start our review. I spent some time in the afternoon reading The Pray-ers by Mark Mirza that I'm reviewing. Look for both of these reviews later this month! Some more friends stopped by to cheer on Emily's recovery, and Kurt hung a new light over the kitchen sink. Sunday is church, and we all needed a time of refreshing. We love our church family. The message was a continuation of the previous week's - Jesus teaching the disciples how to pray. This is something that God has been working on me about from various fronts recently, and I know He is changing the way I view my prayer life, and how it affects the whole of my daily life. Sunday evening the girls went to the park with friends to play ultimate frisbee and have some more teen fellowship. Arlene played, Em watched this time. While the girls were at the park, Kurt and I went and picked out curtain rods and holdbacks. On our way back to pick up the girls we spotted a hot air balloon. Today Kurt went to work and the three of us girls slept in. It doesn't happen often, and I feel much better. Ever since the wind at the ballgame Tuesday night the ragweed in the air had been really messing with my sinuses. A full, long night's sleep was definitely in order. For the rest of today? Hemming a couple pairs of pants, hemming some new curtains we bought while on vacation, and some more cleaning. Then this afternoon Arlene and I will talk over her plan for school tomorrow, and Emily will make out her list of to-do's that she can do and still be low key for a few more days as her mouth continues to heal. 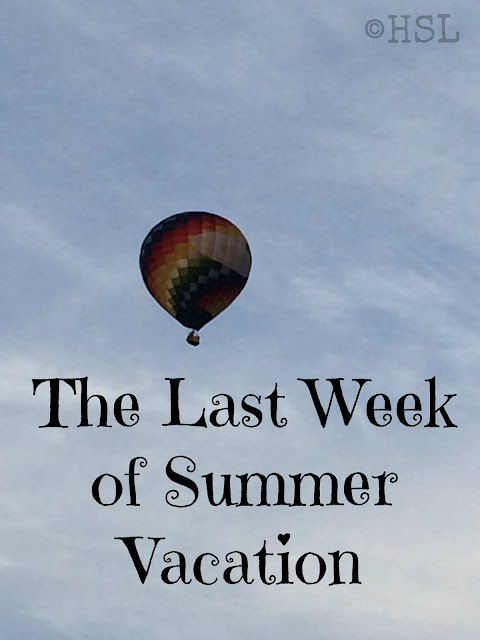 How was your last week of summer vacation? 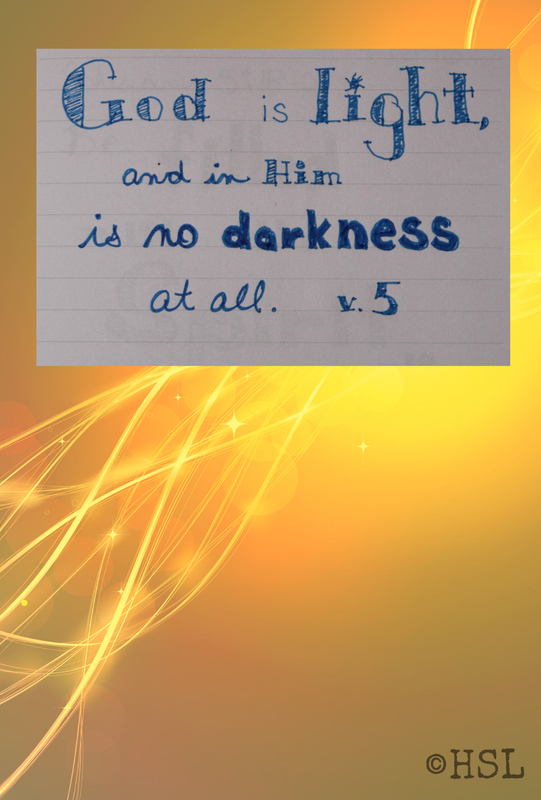 If something comes into your life, or even just into your thoughts, that is not light, but rather darkness, then you can be sure it is not from God! 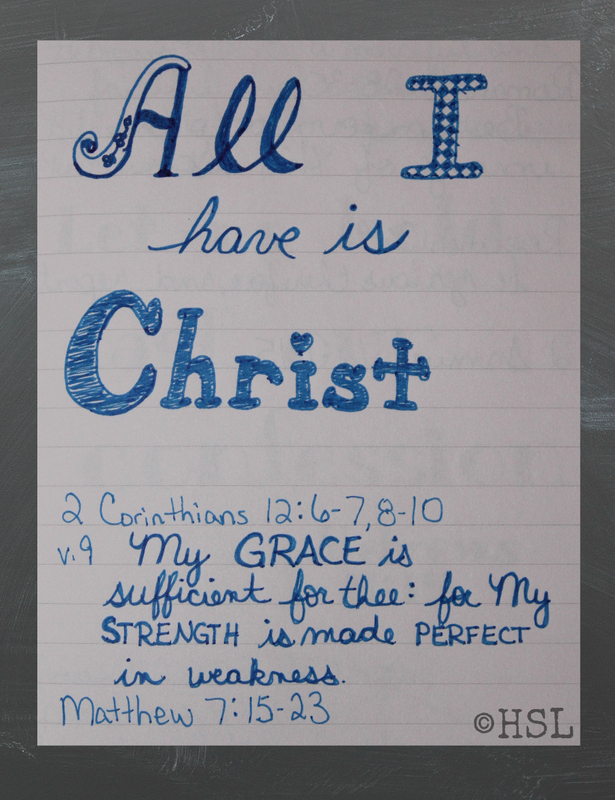 We so often struggle with what God wants from our lives. If instead of trying to find our way for our life, we instead focused on God's way - in everything - we would be focused on what His Word says, and our lives would follow Christ's. Let us choose to focus on God's Word today, and each day that follows, and allow Him to direct our paths. My prayer for you is that you would find peace when you are following Him.